DDT (dichlorodiphenyltrichloroethane) molecule. Controversial pesticide, used in agriculture and for malaria disease vector control. Conventional skeletal formula and stylized 2D rendering. Metolachlor herbicide (weed killer) molecule. Stylized 2D renderings and conventional skeletal formula. 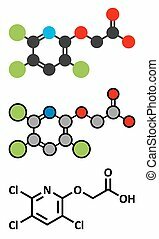 Triclopyr herbicide (broadleaf weed killer) molecule. Stylized 2D renderings and conventional skeletal formula. 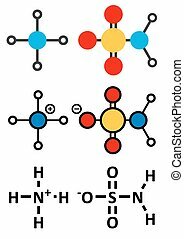 Ammonium sulfamate herbicide (weed killer) molecule. Stylized 2D renderings and conventional skeletal formula. Pendimethalin herbicide molecule. Stylized 2D renderings and conventional skeletal formula. Clopyralid herbicide molecule. Stylized 2D renderings and conventional skeletal formula. Scopolamine (hyoscine) anticholinergic drug molecule. Used in treatment of nausea, vomiting and motion sickness. Stylized 2D renderings and conventional skeletal formula.